Lightly battered & golden fried. Crispy & lightly fried then dipped in your choice of plain, BBQ or teriyaki. Cheese quesadilla. Served w/ sour cream & salsa. With bacon & melted cheddar cheese. Breaded & fried. Served w/ marinara sauce. Three mini rolls w/ your choice of cheeseburger. Served w/ potato chips & a pickle. Grilled on rye bread w/ cheddar cheese & tomatoes. We use fresh ham bones to make the base for this delicious soup. Our own recipe, not too spicy, just right. Served Thursday & Fridays. Rich, creamy & loaded w/ clams. All of our salads, made to order, are served on a golden fresh blend of iceberg, romaine & mesclun lettuces w/ ripe tomatoes, cucumbers & black olives. Julienne strips of ham, turkey breast, roast beef, eggs, mushrooms, cheddar cheese, roasted peppers & marinated artichoke hearts. Fresh leaf spinach, crispy bacon, eggs, fresh mushrooms & red onions. Crisp greens, tomatoes, cucumbers, peppers, kalamata olives, red onions & feta cheese. The classic recipe w/ crisp romaine, parmesan cheese & croutons tossed w/ Caesar dressing then finished w/ tomatoes & olives. Our crispy tenderloin fillets cut into strips & placed atop our salad mixture. May we suggest oriental ginger vinaigrette or honey mustard dressing. Buffalo chicken tenders & bleu cheese dressing atop our crisp salad greens. Crisp greens‏ topped w/ a tender juicy chicken breast. Roasted turkey breast & plenty of bacon makes this salad outstanding. 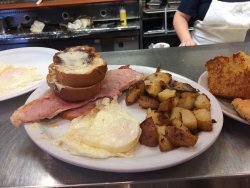 Two eggs any style, fresh ham, toast, home-fried potatoes & coffee or tea. 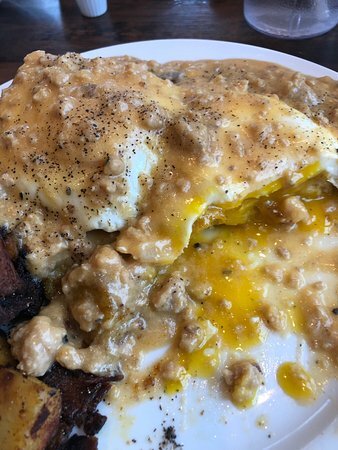 A buttermilk biscuit topped w/ 2 eggs, cooked to order & smothered w/ our zesty sausage gravy. Served w/ home-fried potatoes. Shaved, dried beef in a Bechamel sauce made w/ butter & cream over Texas toast. Served w/ homefries. Choice NY‏ sirloin steak served w/ two eggs any style, toast, home-fried potatoes & coffee or tea. A toasted English muffin topped w/ homemade corned beef hash, two poached eggs & covered w/ hollandaise. 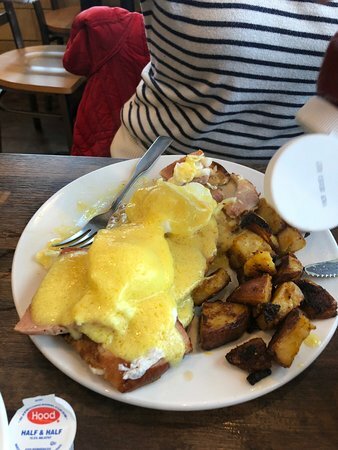 A toasted English muffin topped w/ our baked ham, two poached eggs & covered w/ hollandaise sauce. Served w/ home-fried potatoes. 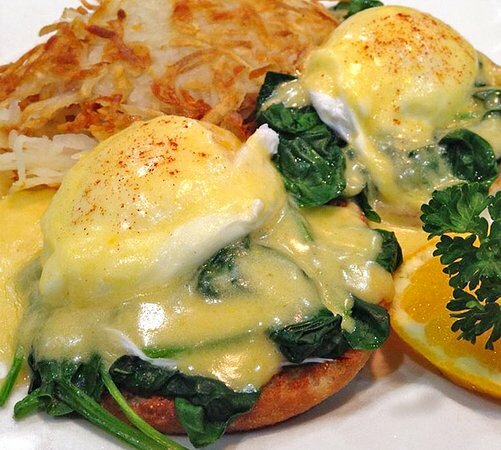 A toasted English muffin topped w/ tomatoes, fresh spinach, two poached eggs & covered w/ hollandaise sauce. Served w/ home-fried potatoes. With bacon,‏ ham, country, or link sausage. Two pieces of French toast spread w/ cream cheese & folded w/ apples, bananas or strawberry jam in the middle, then dipped in our batter & grilled golden. Low in fat & cholesterol. French toast dipped in granola, grilled golden & sprinkled w/ cinnamon sugar. Dipped in‏ batter made w/ cholesterol free eggs. With bacon, ham, country or link sausage. Made right here! With your choice of strawberries or bananas & whipped cream. With bacon, ham country or link sausage. Pita bread filled w/ one scrambled egg mixed w/ fresh vegetables & cheese. 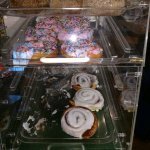 One egg w/ cheese, ham, bacon, sausage or kielbasa on toast, water roll or English muffin. 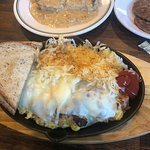 One egg & our homemade country sausage w/ fried onions & cheese on a grilled roll. One egg w/ cheese & homemade corned beef hash on a grilled roll. One egg scrambled w/ green peppers, onions & diced ham on a grilled roll. With cheese, jalapenos, peppers, onions & salsa. All of our omelettes are made w/ 3 fresh eggs, the freshest vegetables & meats. 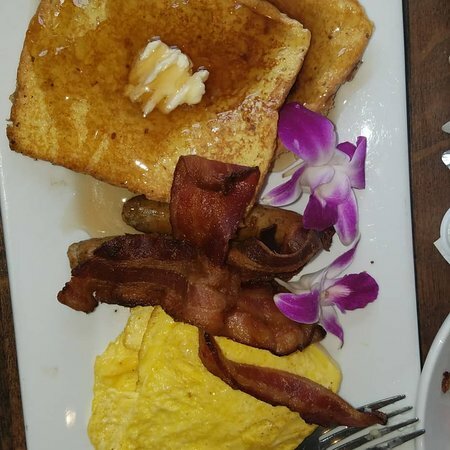 Our fluffy omelettes are served w/ buttered toast & home-fried potatoes. Our homemade country sausage w/ green peppers, onions, potatoes & cheese. Ham, Onion & green peppers. Fresh vegetable blend w/ cheese. Cheese, mushrooms, onions, peppers & tomatoes. All specialty sandwiches are served w/ your choice of potato salad, potato chips, cole slaw, garden salad or French fries & a pickle. Thin sliced turkey breast topped w/ bacon, lettuce, tomatoes, onion rings, mayonnaise & cheddar cheese on a roll. Thinly sliced roast beef smothered w/ grilled onions, mushrooms & cheddar cheese served on a roll. A generous portion of pastrami on grilled rye w/ swiss cheese. Flaky white breaded fillet on a water roll w/ lettuce & tomatoes. Mm-mm-m-m... stacked high & piping hot. Your choice of pastrami, corned beef, turkey or roast beef. Our Reuben are served on grilled rye, piled high w/ your choice of meat & topped w/ sauerkraut, melted Swiss cheese & thousand island dressing. Your choice‏ of imported ham, roast beef or roast turkey breast on white, wheat, rye or a water roll. Served w/ potato chips, potato salad, cole slaw, garden salad or French fries. Shaved steak sautéed w/ peppers, onions, mushrooms & cheese wrapped in a flour tortilla. 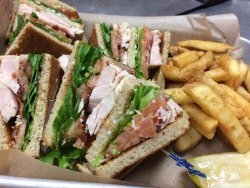 Select two of the following; a cup of soup du jour, a house salad or half of a ham, turkey, roast beef, tuna or egg salad sandwich. Partenaires est le n°1 lit ma liste. 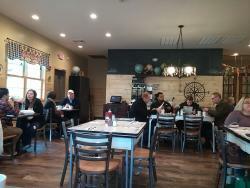 J'ai séjourné dans tous les restaurants le petit-déjeuner dans le coin, et celui-ci possède tout ce qu'il faut : la nourriture était bonne, le service est excellent et tout le menu pour satisfaire tout le monde. On mange très bien à un prix raisonnable. Récemment rénové, avec un beau en plein air. Le service était sympathique. Quartier petit bijou. Un super endroit pour le petit-déjeuner et le déjeuner, propre et abordable. Au menu peuvent être modifiés pour qu'il vienne vous chercher. J'adore le des crêpes aux myrtilles et des Ruben sandwich. On y mange très bien fait ! Propre, super sympa, la nourriture est très bonne, ce n'est pas un immense menu, mais il y a plein de super choix! Obtenez des réponses rapides du personnel et des anciens clients de Partners Restaurant.